Jean Hardouin’s “Prolegomena” is an introduction to a never realized work demonstrating concisely that the writings of the venerated Church Fathers are atheistic. Unfortunately, it is only in the final chapters of that arduous book that Hardouin attempts to bring together his various ideas in a coherent manner. Hardouin states the church fathers writings are esoterically impious and atheistic and he makes frequent references to “rest and motion” and that Nature is the only God of the impious crew. The frequent repetition of “motion and rest” was lost upon this Apprentice. Fortunately, Master suggested Plato’s dialogue of Parmenides to bring life to Hardouin’s ideas of impiety. Since scholars do not agree on the interpretation of this lesser known work, we believe we are on firm ground in assigning an esoteric nature to Parmenides,. The page references are from “The Republic and other works” by B. Jowett, 1989. 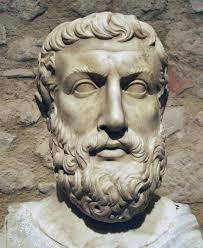 Parmenides is a dry and, at times, painful dialogue. I could not finish it. Although I am of the opinion the the remainder of the dialogue, which attempts to show the denial of the hypothesis, will further disclose impiety. Of course, I am not claiming impiety in Plato’s writings, I am using this dialogue to demonstrate that the repetition of “motion and rest” have their origin in atheistic thought and to perhaps substantiate Hardouin’s claim that the Church Fathers have no God but Nature. Hardouin claims the impious gang placed the writings of the Church Fathers in libraries to be found later. Since the “Prolegomena” was published after Hardouin’’s death, one wonders if the impious gang did not write this prologue in his name. One premise of this introduction is that the Latin Vulgate Bible was too well known and, therefore, could not be tampered with by the impious crew. The Council of Trent appeals to the well known Vulgate and decrees that this same ancient Vulgate be used in the publication of a new edition. As of this writing, no ancient and universally known Vulgate has come to light, so the Roman Church waits to fulfill this decree.